Russell Eberst in Scotland has recovered the noon-plane KH-11 ADVANCED CRYSTAL/"Keyhole" optical reconnaissance satellite USA 224 (2011-002A) this week. The recovery happened relatively late (in 2015 it was recovered 2 months earlier). 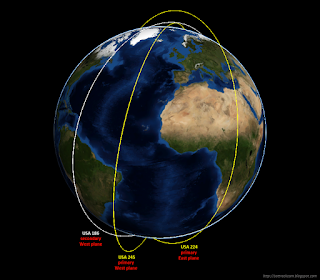 This recovery means that, after the preliminary update last March, I can provide my periodic update on the orbits of the KH-11 constellation based on timely orbital data. In various previous post to this blog, I outlined how the KH-11 constellation consists of two primary orbital planes, the primary East and West planes; and originally two, now one, secondary orbital plane(s). Of the latter secondary planes, only one, the secondary West plane, is left after the de-orbit of USA 161 late 2014. The past decade or so, the primary planes have been 48-49 degrees apart in RAAN. That is still the case: USA 224 and USA 245, the primary East and West plane KH-11's, are currently 49 degrees apart in RAAN. The secondary planes used to be either 10 or 20 degrees from the corresponding primary plane in RAAN, but since mid-2014 the secondary West plane (currently USA 186) has moved further out, to 24 degrees West of the primary orbital plane. 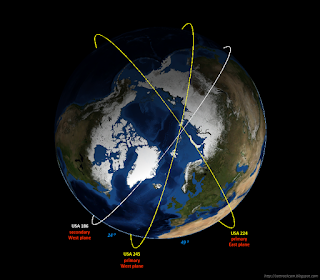 Given are the apogee and perigee altitudes of the satellites, the average local time they pass through their descending node (an indication of around what time they pass a given area - all satellites in the constellation are sun-synchronous, i.e. they pass at a similar solar elevation each day), the repeat interval of the ground track in days, and the plane they orbit in. What can be seen is that the secondary plane satellite, USA 186, is in a much more circular orbit with a much lower apogee (454 km), compared to the two primary satellites (~1000 km). Perigee altitudes of all three satellites are similar. I have speculated on the reason for this apogee difference of the secondary plane satellite at the end of a previous post. The West plane satellites, USA 186 and USA 245, make morning passes, about 1h45m after each other. The East plane satellite, USA 224, makes passes about an hour after local noon. The current orbital configuration has been more or less stable since mid-2014 (or more exactly, since USA 161 was de-orbitted late 2014).